Moses David Fink was the fourth child born to Daniel Fink and Elizabeth Beaver. Moses was born 28 Sep 1836 in Tennessee according to the 1860 and 1880 Censuses. "September 25th 1836 was born to Daniel Fink a son and was baptized August the 12th 1838 and named Hosei David." Both the 1850 & 1860 Census lists one son as Moses D. Since the birth years are the same, Mosed David Fink is more thank likely the same Hosei David Fink mentioned at St. Martin's Church. 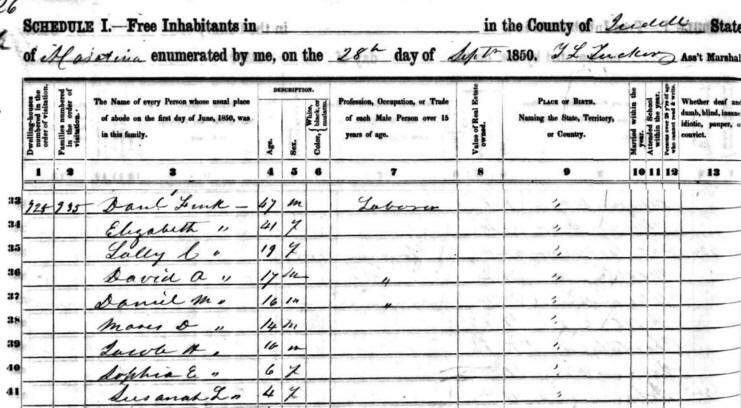 The 1850 Iredell County Census shows that Moses was 14 years old and living at home with his parents and all of his siblings. The 1860 District South of the Yadkin Census for Iredell County shows that Moses was 24 years old and living at home with his parents and siblings. Older brother David Alexander had left the family home and was living by himself in the Rocky Creek District of Iredell County. This is the first census that lists Moses' place of birth as Tennessee. Next-to-youngest son Moses Fink was the third of Daniel & Elizabeth's sons to enlist in the Confederate Army during the Civil War. Moses enlisted as a Private on 27 Jan 1862 at the age of 24 in Company 2nd B, 42nd Infantry Regiment North Carolina. Moses enlisted in Rowan County, NC. By 1870, Moses had married Louiza Angeline Cline. Louiza was born 25 Sep 1836. They were living in the Scotch Irish Township of Rowan County. They had two children, James B. (actually James Clarence) and Henry A. Fink. There is a possibility that they might have been Louiza's children from a previous marriage. (See 1880 Census below.) Moses' occupation was listed as Farmer. The Census also noted that he could read, but could not write. By 1880, Moses and Louiza had moved to the Shiloh Township of Iredell County, NC. The Census lists Moses David's name as "M.D." and Louiza Angeline's name as "L.A." Henry A. is listed as "H.A." with a last name of "Morrison". Henry, age 20, is also listed as a step-son. August 21, 1890 - Monday, the 14th, was the 81st birthday of Mrs. Mary Cline, who lives with her son-in-law, Mr. M. D. Fink, of Shiloh Township. The descendants and other relations gathered to celebrate the occasion, bringing with them baskets of cooked provisions, and counting the neighbors who had been asked in, 49 persons sat down at the table, with A. L. Alexander, Esq., at the head and Mr. R. F. Cline at the foot. It was a happy gathering and a memorable day to all who were there. The 1900 Iredell County Census shows Moses, age 63, and Louisa, age 64. They had a 15-year-old nephew, Preston Johnson, living with them on the farm. The Census says they've been married for 34 years and that Louisa had two children that were still living. Unfortunately it doesn't say that this was her 2nd marriage, or that her two sons were not the sons of Moses David Fink. Louisa Angeline Cline Fink died 29 Nov 1900 in Shiloh Township, Iredell County, NC. Mrs. L. Angeline Fink, wife of Mr. Moses Fink and sister of Mr. R. F. Cline, died at her home near Brady's X Roads in Shiloh Township, yesterday. The funeral and interment will take place at Mt. Herman Church today at 2 o'clock. Mrs. Fink was 65 years old and her husband and two children survive. The Statesville, NC, Newspaper, The Landmark, tells of 64-year-old Moses' marriage to an 18-year-old orphan named Miss Bessie Freeman. The article lists his middle name as "Devalt" instead of David and lets us know that the ceremony took place in Shiloh township, the same location Moses had lived for at least the past 20 years according to the 1880 and 1900 Censuses. The Landmark further said that the marriage took place at the home of Henry Morrison, Henry's "step-son" with Louiza. 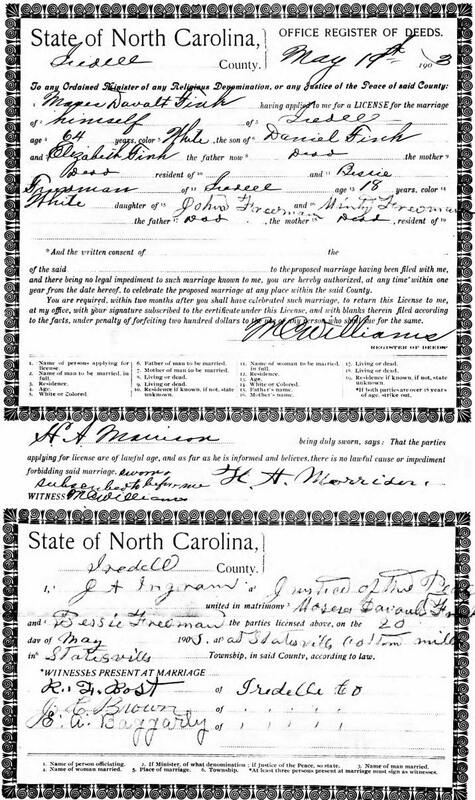 Moses and Bessie's marriage license shows that they were married on 20 May 1905. It seems to indicate, also, that they were married at the Statesville Cotton Mill instead of at the home of Moses' step-son, Henry Morrison. Bessie was the daughter of John Freeman and MinD Freeman. The Justice of the Peace was J. A. Ingram and the witnesses were R. F. Bost, J. C. Brown and E. A. Baggarly. I, J. A. Ingram, a Justice of the Peace united in matrimony Moses Davault Freeman and Bessie Freeman the parties licensed above, on the 20 day of May 1905, at Statesville Cotton Mill in Statesville Township, in said County, according to law. The Friday, May 6, 1904 issue of The Landmark tells us that Moses had "lost his mind to some extent". 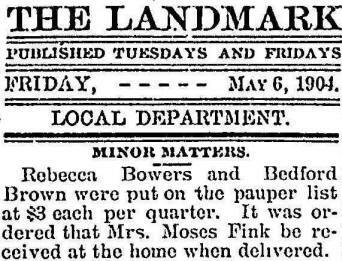 Another article tells how Mrs. Moses Fink (Bessie Freeman Fink) was to be received into the "Poor House". 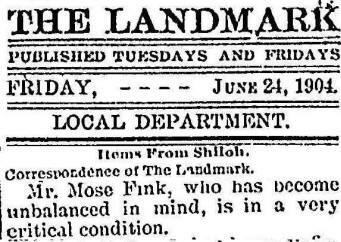 The June 24, 1904 issue of The Landmark tells us that Moses' was still mentally unbalanced and that he was in "critical condition". 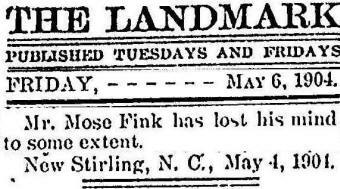 The following article found in the Statesville LANDMARK tells of Moses Fink's death. 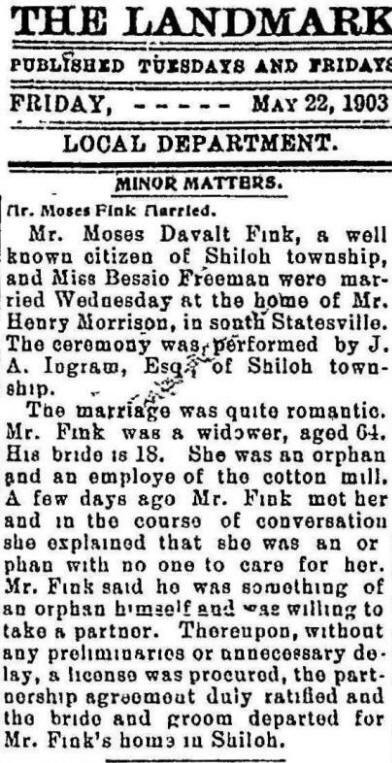 Fink, Moses - aged about 94 years, died Feb 9, 1910, at the home of Van Morrison in Shiloh Township, Iredell County. Burial at Mt. Herman Lutheran Church. The following 1910 Census shows Moses' widowed wife, Bessie Freeman, living with his sister Sophia who married Jules Hall. I found a Bessie Fink (Widowed) of approximately the same age on a 1920 Census living in Bessemer City, Gaston County, NC, and working at the local cotton mill. I also found a Bessie Fink in the North Carolina death collection living in Gaston County who died 12 Dec 1922 at the age of 39. If this is Moses' Bessie, she surely fell into hardships after his death and died very young.